other information Chris Smith CBCD001, 2005. "Recorded July 24-28 2003 in Taos, New Mexico. 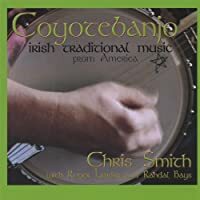 All instrumental tracks--melodies and accompaniments--recorded live (banjo/fiddle/bouzouki) in the studio, a la jazz recording. Bodhrán recorded July 28 2003. Songs recorded with voice, fiddle, bouzouki, mandola live in the studio; field organ, mandolin recorded as overdubs." (E-mail from Chris Smith 23 Sept 2005).